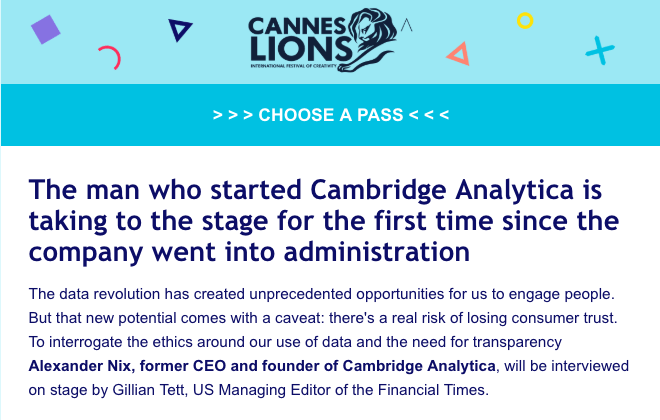 The controversial former Cambridge Analytica CEO Alexander Nix will speak on a panel at this year's Cannes Lions festival. 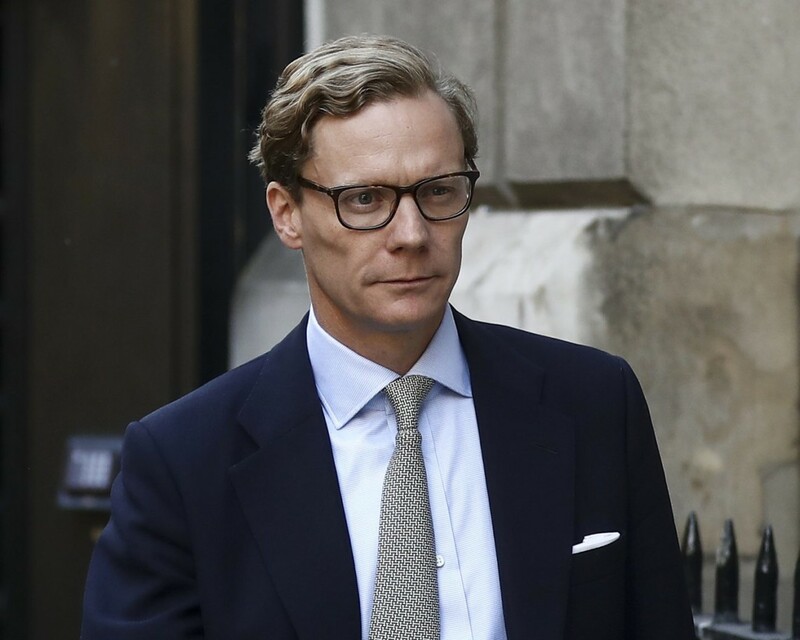 The Cannes Lions Festival of Creativity announced on Wednesday that Alexander Nix, founder and former CEO of controversial data and political firm Cambridge Analytica, would be among its list of featured speakers for this year’s five-day event. Nix was forced to step down after his firm was tied to a massive data breach that exposed the private data of more than 80 million Facebook users last year, and the company later filed for insolvency. The panel, to be moderated by Financial Times U.S. managing editor Gillian Tett, will explore the topics of personal data and political agendas. "This seems like the conference version of clickbait: a session that is purposefully engineered to stir outrage." While the Cambridge Analytica scandal alone is enough to raise eyebrows regarding Cannes’ selection of Nix, the former CEO has drawn enough criticism for controversial comments he’s made in the past to attract scrutiny. The Guardian report came after Nix finally testified before Parliament in June 2018, after refusing to go before British lawmakers who accused him and his firm of unethical business practices, abusing user data and playing a role in swinging the British vote to leave the European Union. 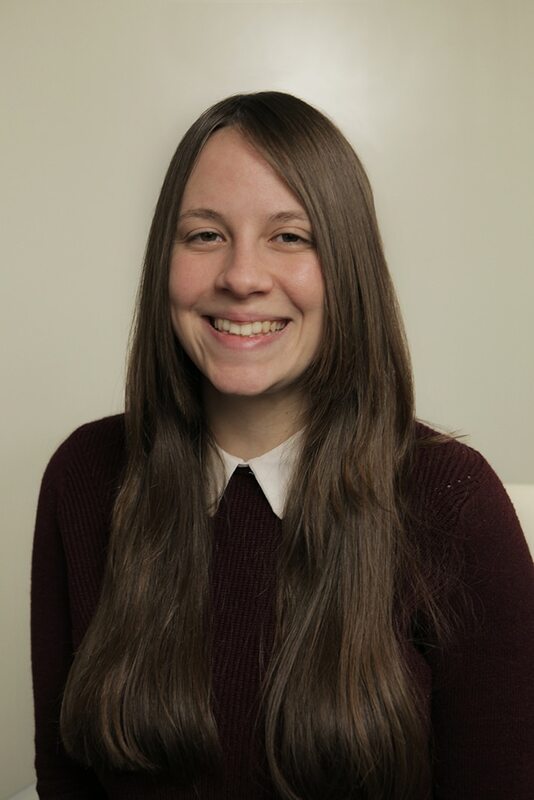 During that hearing, Nix confirmed that Cambridge Analytica collected data on millions of Facebook users without their consent—data that was used in the firm’s political consulting work for U.S. President Donald Trump’s 2016 campaign as well as Brexit—but denied any wrongdoing. "I feel Cannes is shifting from a marketing/advertising festival to more of a pop culture festival." He subsequently received harsh criticism for depicting himself as the victim during his June testimony, as he argued that he was targeted by a “concerted campaign” from the “global liberal media” to destroy his company. Speaking to Adweek, several industry leaders questioned why Cannes would choose Nix as a speaker, given the accusations against him and the fact that he hasn’t provided any thoughtful discourse on the issue of data privacy in the past. David Gross, head of digital and performance and founding partner at Anchor Worldwide, called the decision “tone deaf” on the part of Cannes. Others suggested that the festival is purposefully trying to create buzz around the event. This morning, a press release specifically promoted his appearance.